Ideal Glass and Glazing work in West Sussex and the surrounding area to help homes and businesses get the most out of their living and office space. If you can’t find your area listed below then please contact us as we might be able to help you. Where do we work in West Sussex? Most settlements in West Sussex are either along the south coast or in Mid Sussex, near the M23/A23 corridor. 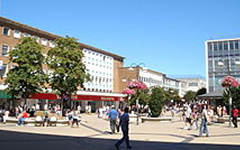 The town of Crawley is the largest in the county with an estimated population of 106,600. West Sussex is bordered by Hampshire to the west, Surrey to the north and East Sussex to the east. The English Channel lies to the south. West Sussex is officially the sunniest county in the United Kingdom according to Met Office records over 29 years with an average 1902 hours each year. If you have been pleased with the service you have received we would love to hear from you. To leave a review, simply click the link below.